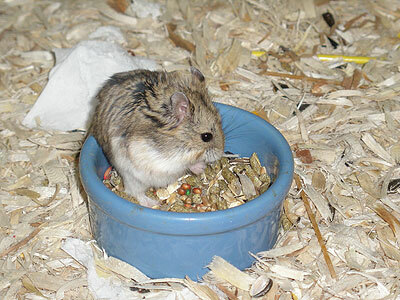 What are Roborovski Dwarf Hamsters? Commonly known as Roborovski Dwarf Hamsters or Robo Dwarf Hamsters (Phodopus roborovskii) is a species of dwarf hamster. Distinguishing characteristics of the Roborovskis are the white spots where the eyebrows would be, and the lack of the dorsal stripe seen in all other dwarf hamsters. They live, on average, to three and a half years of age - the longest of any domestic hamster. Recently, a mutation has arisen producing a "husky", also known as "white-faced", phase. Breeding these lines with agouti Roborovskis produces a diluted appearance of their natural sandy color. Lt. Vsevolod Roborovski first made note of these hamsters. He discovered them on an expedition in July, 1894, though they were not studied scientifically for the best part of another decade, until Satunin made observations in 1903. London Zoo imported them into the U.K. in the 1960s, but the first studied in Britain were imported in the 1970s from Moscow Zoo. (None of these hamsters, however, bore offspring.) Continental European countries had more success in breeding Roborovskis, however, and the Roborovskis currently in the U.K. are descendants of a batch imported from the Netherlands in 1990. They were imported in the U.S.A. in 1998, where they remain uncommon, though they are now commonly found in pet shops in several countries. In South Korea, they are almost as common as Winter white Russian dwarf hamsters in pet shops. They are also fairly commonly sold as pets in Israel. Click on any of the pictures throughout the site to zoom and for a close-up.